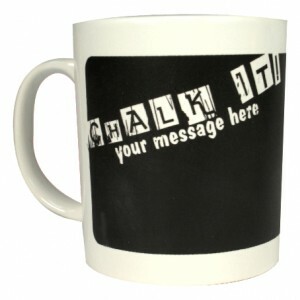 Want a chalk message mug cheap? Take a look at our Cheap Promotional Chalk message mug. With a capacity of 330ml and a transfer print area of 220mm x 80mm and a direct print area of 185mm x 70mm, and prices from £1.15 this is going to be a winner. Always losing messages on sticky notes left lying around on your desk? Can you never find paper to write important notes from calls? 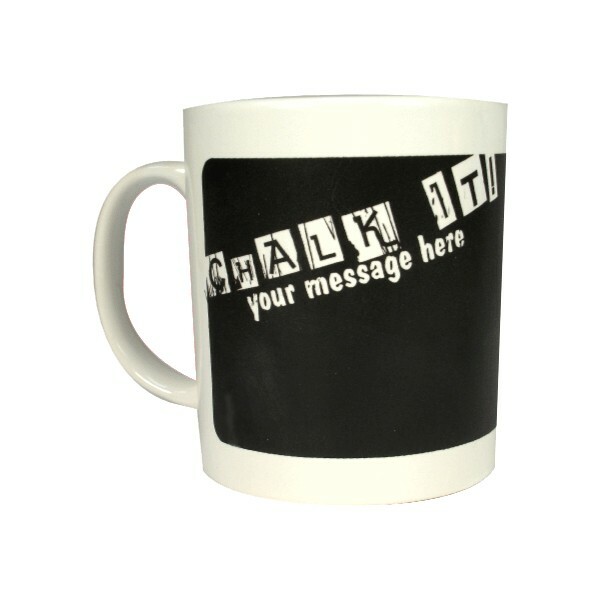 We have a handy solution, the Cheap Promotional Chalk Message Mug, has a matt finish area which is makes a perfect black board surface for leaving messages for team mates in chalk (included). Once the day is over, these messages can be easily removed in the washing up process. A great bit of inventive promotional drinkware from Cheap Promotional Mugs.